The first chapbook from our Barometric Author's Series is now available in print! Available in Paperback from Amazon.com ($5.00 + S&H) Order Here! 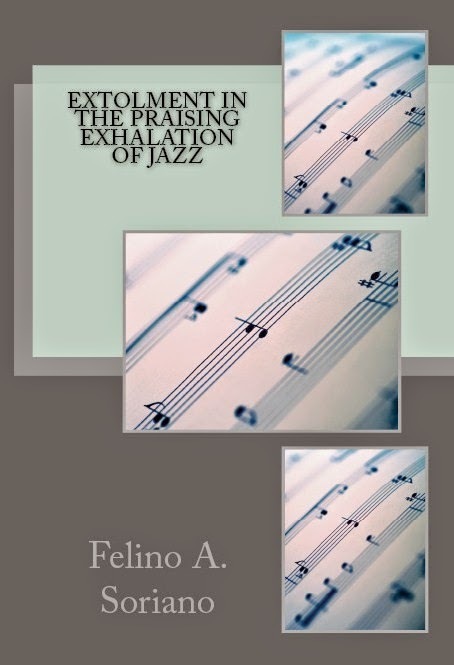 in the first chapbook from Kind of a Hurricane Press's Barometric Author's Series, from Felino A. Soriano, jazz's imperative devotion to improvisation drives and sustains the language within Extolment in the Praising Exhalation of Jazz. Through the delving process of interacting with various recordings during the creating of each poem--cadence, form, and divergence are considered in accordance to the language of the music's fluctuating permissions and freedom toward invitation. Our 2014 Pushcart Prize Nominations have been finalized . . . .
“Twenty Eight Seconds” a flash fiction piece by Marla Kessler (published in our print anthology, Life is a Roller Coaster, in October 2014). 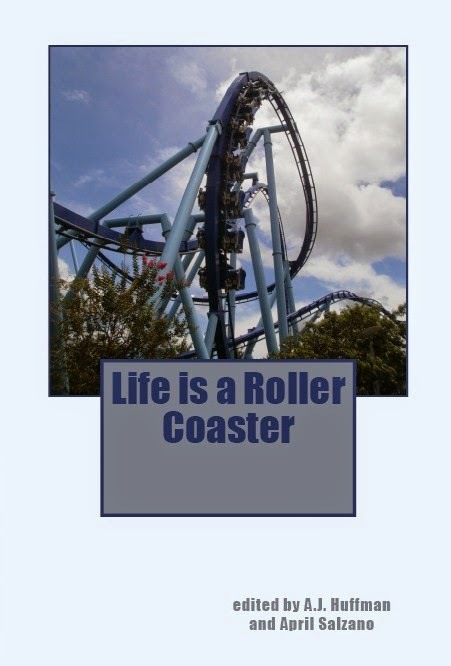 Life is a Roller Coaster is Now Available! In creating the fourth anthology of 2014, Kind of a Hurricane Press asked our authors to let the exhilaration and fantasy of their favorite amusement park carry their muse to soaring new heights. As always, our authors found myriad ways infuse our pages with the ups, downs and freefalls of a life infused with the spirit of these amazing places. So take a moment, and ride the edge of the rail with us. Enjoy. 2013 Storm Cycle is Now Available in Bookstores and Online Retailers! That's right! Our 2013 Storm Cycle (Kind of a Hurricane Press Best Of Anthology) is now available through most major bookstores and online retailers! This is our first foray beyond our print-on-demand anthologies, and we hope to make more of our future anthologies available in this way. Thanks again to all our authors. Without you, none of this would be possible. Announcing the First Two Anthology Themes for 2015!!! 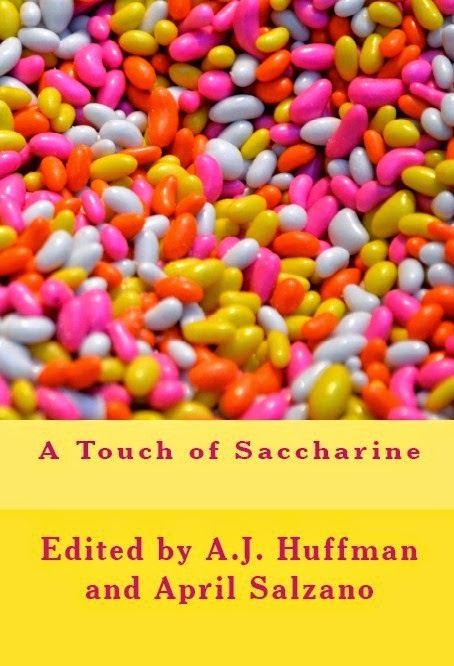 A Touch of Saccharine is Now Available!!! In creating the third anthology of 2014, A Touch of Saccharine (172 pages), Kind of a Hurricane Press asked our authors to let the sugariness of their favorite candied confection melt on their minds and drip through their pens. As always, our authors found myriad ways to infuse our pages with sticky stories and stanzas of every variety. So take a moment, and indulge your literary sweet tooth. Our New Book Review Site is Now Live!!! For this new site, we are looking for authors who are interested in having their poetry collection or chapbook reviewed by our staff editors, and we are also looking for third-party reviews of poetry, flash or fiction collections or chapbooks. See guidelines on the site for more information. 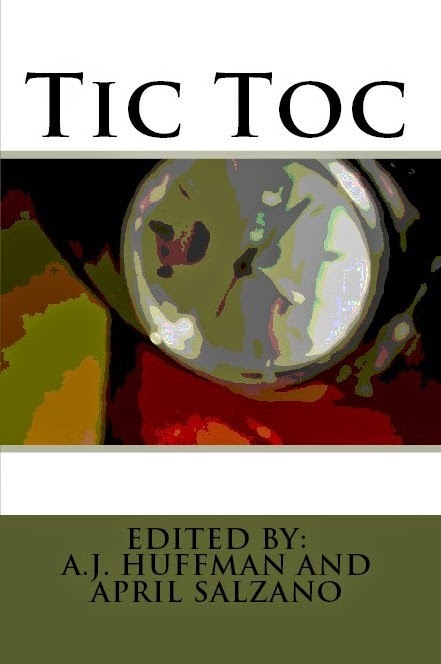 Tic Toc is Now Available!!! In creating the second anthology of 2014, Kind of a Hurricane Press asked our authors to let their minds drip through the hourglass. In this diverse collection of poetry and fiction, our authors created a kaleidoscopic array of time tunnels for the reader to travel through. So take a moment, pick a door, allow yourself to fall into and through visions of past memories, revel in tangible interpretations of today, or leap light-years ahead of your own future. Enjoy. See Our Bookstore for Details! Storm Cycle 2013 is Now Available!! 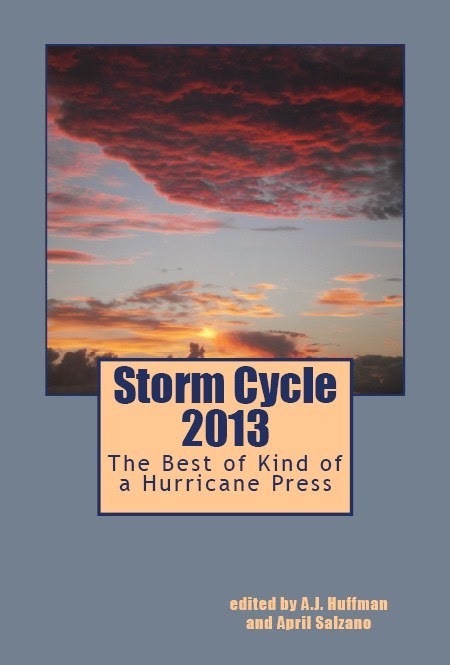 Storm Cycle 2013: The Best of Kind of a Hurricane Press (480 pages) is a compilation of the editors’ favorite pieces from the six 2013 online journals as well as our seven 2013 print anthologies. A tireless search for poetic talent proved exceptionally fruitful, and the selection process for this anthology was brutal. After a great deal of reading, re-reading, and discussion, the editors amassed an extremely diverse and eclectic body of work to put forth to represent what Kind of a Hurricane Press is about: publishing the best poetry and flash fiction being crafted today. 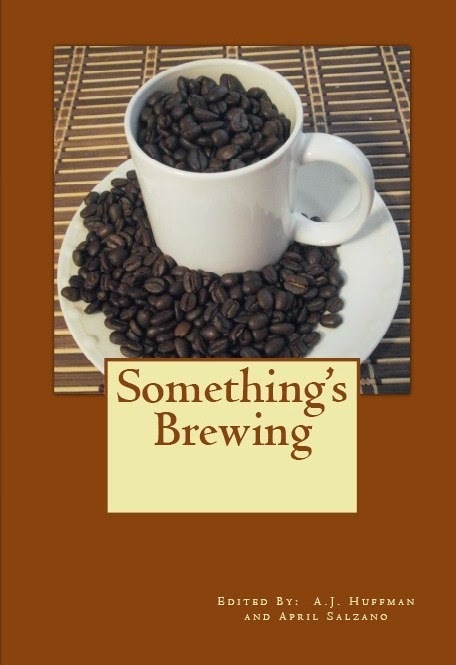 Something's Brewing is Now Available! In creating the first anthology of 2014, Kind of a Hurricane Press asked our authors to drink in the inspirational aroma of coffee. As we suspected, this anything-but-common drink infused itself into all aspects of our writers’ lives, and they were more than happy to share a few cups of caffeinated contemplation with our readers. So take a moment, grab your own cup, sit back, relax, and toast to our ode to everyone’s favorite beverage. Submissions are now open for the 2014 Editor's Choice Award! Announcing the Next Three Anthologies for 2014!!! 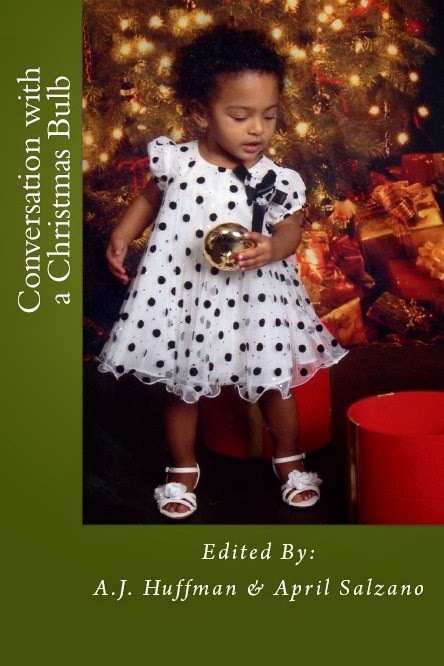 Conversation with a Christmas Bulb is Now Available! In creating the last anthology of 2013, Kind of a Hurricane Press asked our authors to share their special holiday memories with you. Some are contemplative, some sentimental, some heartbreaking, some humorous, but now all of them are part of our writing family. Hopefully, they will work their way into your heads and into your hearts. Happy Holidays.